Malaysian food is definitely my all time favourite cuisine. It is the one cuisine I could never get sick of, perhaps it is because of the family roots from the mothership's side? I am really not sure. Whenever I crave for Malaysian, I think of their roti, laksa, CKT, Char Ho Fun, Hainanese chicken rice, Bak Kut Teh and so forth. Each dish slapped onto their own plate or bowl and served at a rustic dinner table surrounded by small little plastic stools. Besides the home made Malaysian feasts cooked by the mothership, the other place that can satisfy my cravings is an old time favourite, Albee's Kitchen. It hits the spot every single time. Albee's Kitchen is anything close to being fancy but with cheap prices, large servings and authentic flavours, you really can't go wrong. And with the rustic decor and plastic tables, it really reminds me of my second home at times. I am normally not a fan of curry puffs but I personally think Albee's Kitchen has Sydney's best curry puffs. Big call? Maybe and yes at $2.50 each, it can appear to be a bit steep butttttttttt it is packed with so much stuff; egg, sweet potato, curry chicken and beans. The deep fried pastry shell also adds an another type texture so it isn't all soft and mushy. A must-have for every visit to Albee's Kitchen. The nasi goreng (aka Malaysian fried rice), loh mee as well as the CKT are huge servings. In fact, it is probably almost impossible to finish the loh mee all by yourself as it is basically a ginormous bowl filled with thick noodles from the very bottom to the top. There isn't really a "soup" in loh mee, it is meant to be more of drowned in a lot of sauce. A very heavy dish to have on your own but one of the most value for money dishes on the menu. The nasi goreng is also another winner as it is covered in a generous amount of deep fried spring onions. I also love pouring spoonfuls of sambal all over it, so freaking addictive. The fried egg goes well with the prawns and rice but I prefer my egg to be a lot more runny so I can mix the yolk all the way through the rice. I was craving laksa so god dam badly that day I visited Albee's Kitchen. I wanted to face plunge my entire face into the steam and aroma coming from a bowl of laksa and devour it all within minutes. The first bite is always the best but unfortunately, the one I had didn't entirely satisfy my cravings. 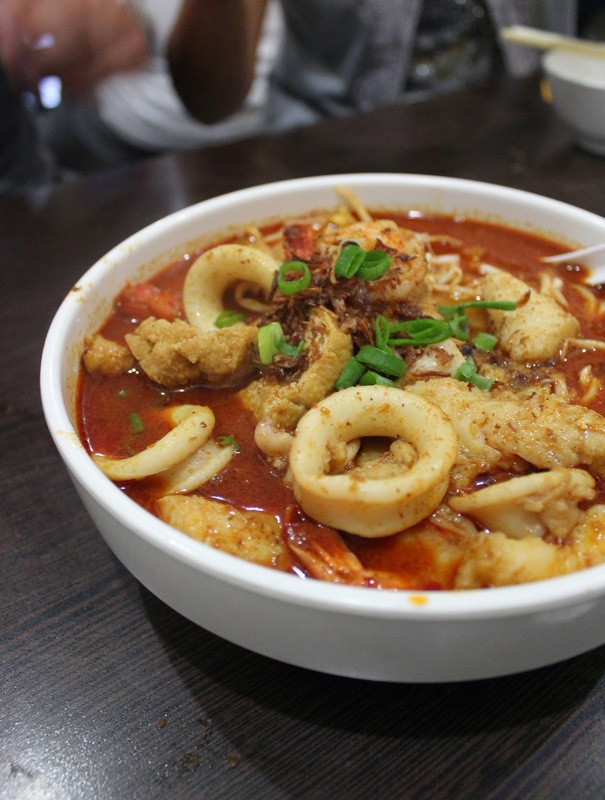 It wasn't a bad laksa, it just tasted average although the generous serving of seafood slightly made up for it. Another dish that I now always order besides the curry puffs is the home made soft tofu. It was only recently that I discovered how awesome this dish was. The photo really doesn't do any justice to it but it basically comes out covered in aluminium foil served on a hot plate. Pork and tofu might sound boring on a menu but it is so so soooooo good because the tofu is immensely soft. One spoonful of the tofu and it feels like it has instantly melted in your mouth. And if you were wondering, no I didn't finish everything on the dinner table because of their ridiculously large serving sizes. Thank gosh for takeaway boxes. In saying that, I can't wait to come back and satisfy my Malaysian cravings as well as packing some lunch for the next day. Love the curry puffs here! And the maze of extra dining rooms out the back always cracks me up! I haven't had a good fix of Malaysian for a very long time. This place looks great. hehe i love their curry puffs! so freaking flaky! i love thel oh mee here, i can order 1 and have it for 2 meals cos of the massive serve! LOL 'mothership'. Where is the roots of 'fathership'? I came here many years ago and remember dishes were hit and miss. I'm not a fan of that wedge of boiled egg in my curry puffs which I think is a Singaporean trait. Much prefer the 'kari pap' made by the Malay 'kaks' in KL which is a lot spicier without the egg. With these statement "Albee's Kitchen is anything close to being fancy but with cheap prices, large servings and authentic flavours, you really can't go wrong" I really want to dine here. 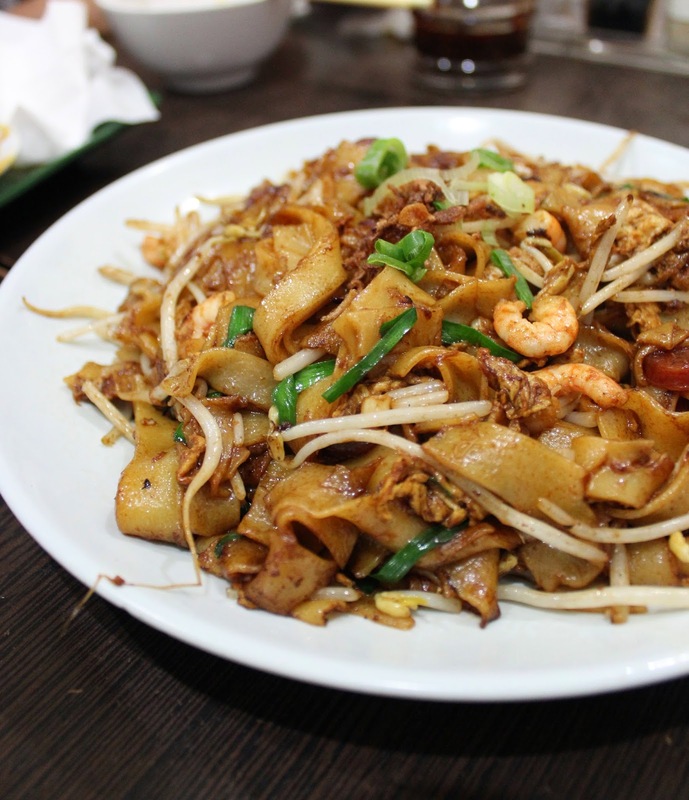 That Char Kuey Teow looks so tasty. I could use a big bowl right now! THEY HAVE LOH MEE!!!! THEY HAVE LOH MEE!!!!! Must. Go. Now!!! The curry puff is also a fav!! I don't know what it is but there is something very mmm~ about it! And the fact that it is MASSIVE!!! Curry puff is the best!